With Halloween fading in the rearview the holiday shopping period is just around the corner. In the true spirit of the season I'm pawning merch. • Standard size deck (3.5" x 2.5") contains 52 playing cards plus two jokers. 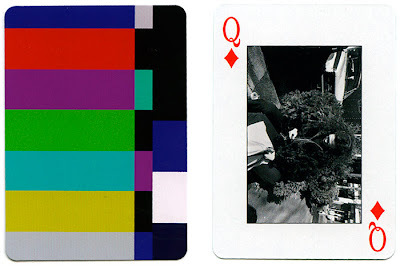 • Card front features b/w photo visually depicting the face value of the card. Card backs feature TV test screen pattern. • Photos selected from In-Public, family shots, unseen B Sides and outtakes, and other 35 mm personal favorites. • Made by Printer Studio, printed on 100% casino quality paper stock. Production quality is excellent. • First edition limited to 75 decks. • Includes clear protective case and two handmade 5 x 7 RC photos. • Inexpensive— A typical photography monograph costs $40+. A pack of B SIDES is $12. That's a $28 dollar savings for every pack bought. Buy 100 and you just made $2800. If you buy enough packs we could both get rich. • Malleable— A typical photography book is carefully sequenced and meant to be read in one particular order. A pack of B SIDES can be sequenced in 8 x 10^67 ways. Don't like a certain sequence? Just reshuffle. • Portable— A typical photography book is large, unwieldy, and precious. 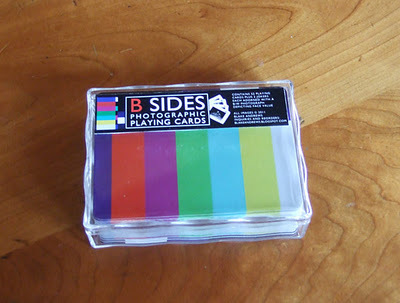 A pack of B SIDES fits in your pocket, protected by a plastic case. • Entertaining— When you finish reading a typical photography book, it's done. But when you finish browsing B SIDES you'll find yourself holding a deck of cards. Play games, build card houses, do magic tricks. The possibilities are endless. And when you get tired of card games, Bingo! You've got photos to look at. • Versatile — Photography books normally appeal only to photo geeks. But B SIDES have multiple appeal. They make a great stocking stuffer for the family shutterbug or the family cardshark. Orders accepted now. Cards will begin shipping in late November. Sorry, folks. As of 9/4/12, this item has SOLD OUT. If there is enough interest I may print a second edition. Please email if interested and I'll let you know if/when a second edition is released. the "shuffle" feature really caught my attention! is this for real? is it for time limited period, or goes on indefinitely? i would order now, only that i live in bangkok, thailand, and it's now catastrophically flooded. Sorry if it wasn't clear. Yes, this is a real product for sale. 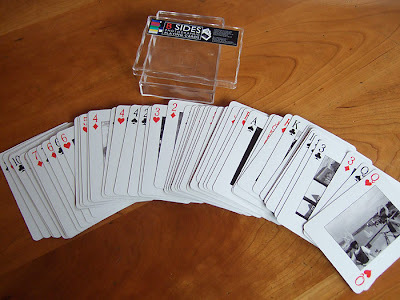 The cards will be available at least through the end of the 2011. Hope the floods clear soon. Can't wait for it to arrive - I bet its shuffle feature is way better than the iPod Nano. I got mine, went through them. I love what you did making the photo kind of match the card number (females on queen cards, ten balloons on one of the 10 cards, etc etc. I noticed when I got to the five of clubs, now I'm going back to see what I missed). What's the QR code on the black joker card? My phone can't read it and it's killing me. I'm not sure what the QR says. It's an imprint from Printer Studio, the company that made the cards. Probably a top secret missile launch code or something. i just don't believe that plastic cards can be used there..thanks for sharing. A great read. Thank you so much for taking the time to share such a interesting information. It’s great to see a piece that puts everything in simple terms !